SEO in 2017 – What’s The Latest? Every SEO I know right now is putting together a roundup post of “what #X experts think of SEO in 2017”. I’m going to do it differently. If you’re down in the trenches doing SEO, you should have a pretty good idea about where SEO has come from, where it currently is, and where it’s going. I help 60-70 businesses a month find an agency or consultant to work with, mostly for SEO. I also work with a few enterprise sites privately doing consulting to help them drive business to their sites through organic means. Here is what I am seeing for SEO in 2017. We live in a day and age where truth seems to matter less than ever, but in reality we’re all searching for it. America has dealt with the challenges of fake news across social networks like Facebook and Twitter, and in 2017 I expect that both Google and Facebook will do even more than we expect to combat the spread of false information and bring the truth to the surface. I expect that this means that they will once again dial up the importance that a strong brand (strong site, a lot of branded queries) has within their ranking algorithms. If you’ve read much about SEO, you’ve likely come across the concept of Domain Authority. Domain Authority is Moz’s predictor of how likely a website is to rank for a query. The stronger your site (aka the higher your Domain Authority), the more like you are to rank for both more competitive terms as well as more longtail search terms. And often, Domain Authority corresponds to a strong brand. You can’t really build a strong brand off of SEO anymore. If you look at the strong brands these days, many of them have good SEO but they’re really good at other things that build their brand. They’re good at social, telling stories, getting coverage. SEO is vitally important to their business, but it’s not the only channel. In 2017, I think brands are going to matter more than ever. And by building a brand, you give yourself a better chance to win your important search results than without a brand. A lot of well-followed SEOs preach the importance of “content marketing”, and yes I think content really does matter. So do all of these agencies and consultants. Content alone isn’t enough to rank you in 2017, though. Sure it helps and can be a great way to attract links and build a brand if done right, but content marketing is never done in a vacuum outside of SEO and promotion via regular outreach (aka link building) and PR. According to Google’s Gary Ilyes, “ranking without links is really really hard“. That is direct from Google. In 2017, links continue to matter. As has been true for the last few years though, it’s the right links that really move your rankings. Links from authoritative brands, not manipulative tactics that work short term but are constantly at risk of being found out by the search engines and penalized, are what will help you rank in 2017. And what you’ll likely find as well is that this helps you build longterm referral and organic traffic. I love content marketing. What you are reading right now is, in fact, content marketing. But content marketing is overhyped in the digital marketing world, and to the detriment of businesses across the internet. I recently saw an “SEO professional” tweeting about the fact that they are participating in Wix’s “SEO hero” content (link) and that to this point he has created 35 thousand words of content aimed at helping his site rank for the [seo hero] term. But where does he currently rank? 98th position. That’s right. He’s near the bottom of the 10th page of Google’s search results. Meanwhile, sites that have a lot more links and way less content continue to rank way better than sites with a lot of (even optimized) content but no links. If you look at the rankings for the term [did the holocaust happen], my site didtheholocausthappen.co ranks 3rd/4th and has links from places like SearchEngineLand and others, while arguably a much better site didtheholocausthappen.help. My site ranks better because of the links to it. There are a ton of resources available on the internet, but if you want to be wise instead of smart and therefore hire someone to do it for you, we have technical SEO consultants on Credo as well. As I’ve said many times already, SEO has changed a ton over the years. When I started fulltime in SEO in 2010, it was easy to get something ranking – buy some exact match anchor text links and watch the money come in. Over time, the effectiveness of links has taken longer (they are still incredibly important, as I argued earlier) and longer to kick in, Google is slower and slower to honor permanent 301 redirects even when they are implemented correctly, and more. Just because SEO takes longer to work than before does not mean that it’s not worth investing in. It simply means that you have to be committed to working on it long term – building content, building links, fixing technical issues. At the same time, because it takes longer than before to work you have to be willing to use other channels to grow your business at the same time. We’re actually lucky as digital marketers that Facebook now is a very formidable competitor to Google’s advertising business because this means we can now target our users in multiple ways to get them to our sites the first time. And the great thing is, should you put in the work to build a full marketing funnel instead of simply hoping to convert people on the first touch (think about it – target on Facebook, you rank higher for their queries because they’ve come to your site before, retarget them to come back and purchase) you’ll benefit your SEO as well by getting them on your site and then benefitting form the search boost that comes from that. SEO will not die in 2017. But the number of beneficiaries of organic visibility from Google will decline dramatically. Google’s revenue engine is search advertising. We should never forget that. Google started as a business that organizes the world’s information but it has turned into an advertising business that has a love/hate relationship with businesses that build their success off the back of “free” traffic from their search engine. Therefore, Google will do whatever they need to do in order to drive more revenue from ads and get more businesses to advertise through them. 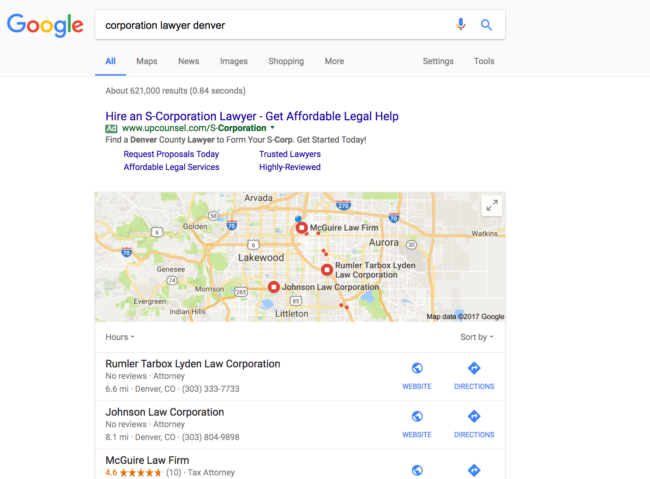 I’m not enough of a cynic to think that Google would suppress a site’s organic visibility in order to juice advertising dollars, but I’ve also seen enough from Google that I also wouldn’t put it past them eventually. Point being, Google needs more ad dollars and they’ll continue to do things like moving more ads up top to do it. Imagine if/when those map listings become sponsored listings. That’s the sort of thing I’m expecting to see in 2017, especially on local business queries. More ads, less organic exposure. So what do you think? How has SEO changed for you and how you think about it for your company in 2017 as opposed to past years?